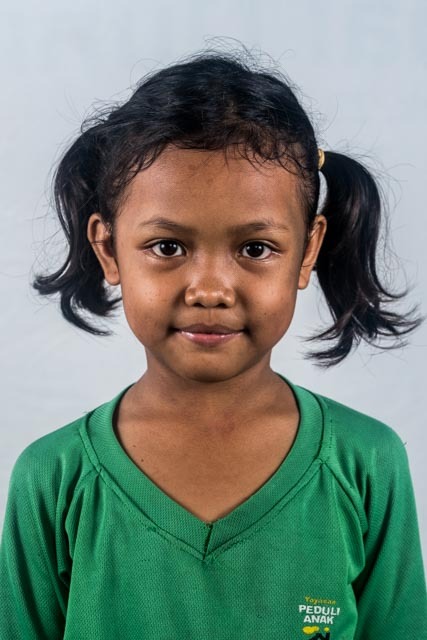 Silvi is a neglected child who lives nearby Peduli Anak. She is the youngest of three. Silvi and her siblings live with her grandmother in a small rented house. Her grandma supports them by scavenging left over rice and lives from their neighbors’ mercy. Silvi didn’t go to school and spent her day just roaming around the house, playing or daydreaming. The village neighbors informed Peduli Anak about Silvi and she now lives in the foundation. Silvi starts going to Primary School. She is a cheerful and smart child. She likes Mathematics. She is also easygoing and likes doing her daily activities in the foundation. In her spare time, Silvi likes reading books and watch Spongebob cartoons. She wants to be a doctor someday.